Exercise or the lack of exercise has suddenly hit me in the face. You see I used to walk every day . Even if it was snowing( which very rarely happens in Ireland) or raining (more the norm here) I walked. Sometimes it was indoors following Jessica Smith on YouTube but I was regularly walking. However during the recent awful hot summer my exercise routine went out the window and disappeared into the stratosphere or somewhere similar and my quilting increased somewhat. Oh yes I really do need to exercise. 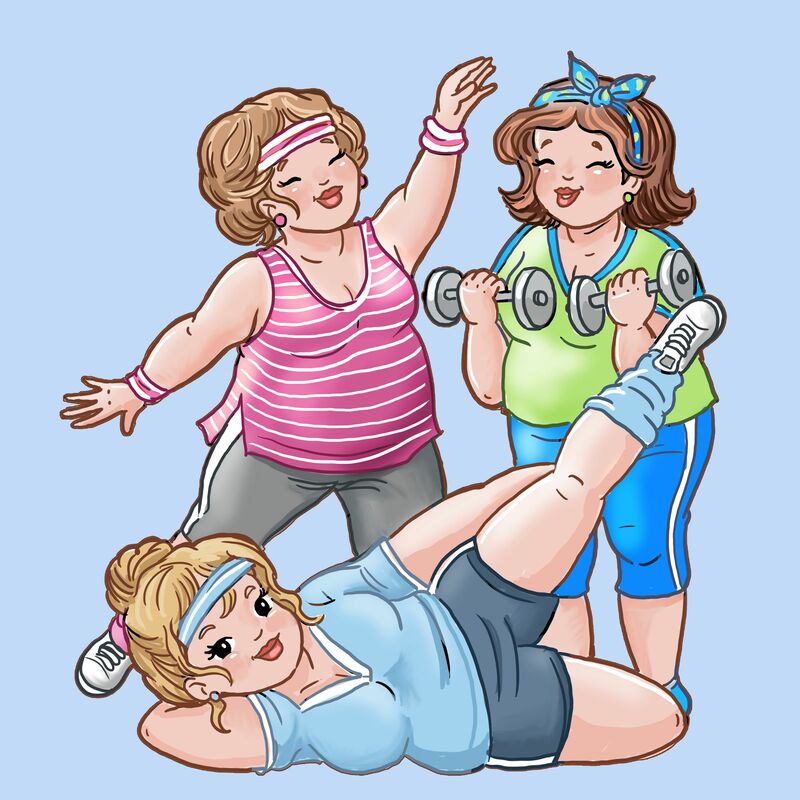 These ladies are fitter and slimmer than me. Now it isn’t that I don’t start to exercise. I do. I have given myself the 30 day challenge and have got as far as day 10, 18 and on the last occasion got to day number 23. Now I have noticed those bat wings , which had trimmed up have now got flabby again so at least I have gone back to those 15 minutes of arm exercises. But really that isn’t enough. When crafting I will make sure to set my clock so that on the hour I will move and do some stretching exercises. But I have also noticed that my the number of WIPs (work in progress) has steadily increased while my mountain of “to be read ” books is now a small hill. Hmm I wonder is there any correlation? So any tips on how to keep motivated. I do not do the gym; been there and fled. I detest swimming. Cycling is ok provided there are no cars ( and I live in a traffic congested town). I have tried horse riding but if I tried it now it would be called animal cruelty. I tried line dancing which proved to be fun but the only drawback was that I could never remember the steps from one week to the next. So seriously any tips to keep going at this exercise lark? What is your motivation? Posted on November 13, 2018 Categories ExerciseTags Motivation, Musings, reading, Sport, WomenLeave a comment on Exercise? Today in some countries national author’s are celebrated. Who would be the national author I would like to be celebrated? The first name which immediately comes to mind is Ruth Dudley Edwards as she is a crime fiction writer but she is also a historian and biographer, Then there is Maeve Binchy, who was a fiction writer but it was her column with the Irish Times on a Saturday which had me hooked. What about Sara Breen and Emer McLysaght? Or perhaps A. O’Connor, the author of “The House” (please see blog post “The Start of a Book Series” for a review)? Eilís Dillon, John B. Keane, Brendan Behan or Frank O’Connor? these authors bring me right back to my childhood together with Patricia Lynch. I would find it so difficult to choose just one author to celebrate National Author’s Day if we indeed we did celebrate it in Ireland. However, I know I will not be able to sleep until I have found some books written by these authors and reread them. The difficulty is which one? So who would you recommend if you were celebrating National Author’s Day? Do you ever come across a book in a different genre to what you usually read and find yourself drawn slowly but surely into the lives of the characters? Then at the end of the book finding it is the first in a series? This has just happened to me. 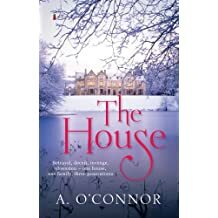 If you like Downton Abbey television series, if you like books about “the big houses”, or perhaps it is more modern rather than historical novels which appeal to you or yet again it is Irish themed novel? Then I have the very book for you. The House by A O’Connor published by Poolbeg Press. Although the books spans many generations the imagery evoked by the author is brilliant. The characters are well-developed and the story line just begs for more. It is one of those books which lures you in until today’s world is forgotten. As the title suggestions the house is the link between the characters of the various generations. As it says on the front of the book “one house, one family, three generations. If you decide to read this book I would love to hear your thoughts on it. Did I Really Miss It? How did I miss it? August 9th was National Book Lovers Day. I mean I love books, adore reading, have some perfect places in which to read. I have the snuggler for when it is cold and of course have the tea-tray with all the accoutrements for the perfect cuppa. So how did I miss it? i totally forgot to note it on my calendar!! If you are a book lover I hope you enjoyed your day. I hope you had time to read. I hope you enjoyed the book. I hope you are enjoying your reading if you are still reading your book. What book do you have on hand? At the moment, I am reading a series of books by P. F. Ford. They are a British Police detective series and which I am thoroughly enjoying. Posted on August 10, 2018 August 10, 2018 Categories Books, UncategorizedTags Book, Musings, Poetry, reading4 Comments on Did I Really Miss It? What a great thought.. by keeping this thought in mind it immediately removes the pressure of “having to make something perfect”. A few months ago, I purchased a bundle of fat quarters. I wouldn’t normally but I decided that the colours would make a lovely quilt. Before I go any further let me explain what a fat quarter is. Fat quarters are pre-cut pieces of cotton, which are taken from a yard of fabric which has been cut in two length ways and each piece cut again width ways. Each fat quarter measures approximately 46cm by 56cm or 18 by 22 inches. I decided I would make a quilt top by sewing eight fat quarters together and then I cut those fat quarters into strips. Any blogs or books which I have read on quilting constantly talk of measuring three times and cutting once. So, this time I followed that rule!! The first cuts went great and I joined up those strips and everything looked pretty good. I returned to the quilt top a few days later and cut those strips up to form narrower strips and again joined them up. Now I haven’t a clue what I did but I ended up with a quilt top that did not have one matching square, but I did have a few marching rectangles. How I got rectangles I have absolutely no idea. It certainly was not what I had intended. I was very disappointed as I thought I had been very careful with the cutting. What I have now is a unique lob sided quilt top. It is very quirky. Now could I gift to any one? I honestly don’t think so. I don’t mind that corners don’t match. What am I saying? There is absolutely nothing which matches never mind the corners. So, I have decided that this will make a great reading quilt. A reading quilt is one of those throws which one needs during winter, when one becomes engrossed in a book and one needs to be cosy. If the skies are grey outside this quilt will bring a bit of colour indoors and enhance the reading experience even more. Saying all that I must admit I love my wonky, lob sided quilt top and need to quilt and bind it in readiness for those hours of reading during the winter.So for me the quote ” the beauty of handmade lies in the imperfections” is very apt. I love the work of Julia Donaldson and the this poem illustrates what reading is all about for me. Posted on May 19, 2018 Categories BooksTags laughter, life, Musings, Poetry, reading, warmth4 Comments on A Book?